Microsoft has plummeted down Britain’s Consumer Superbrands index for 2012, dropping from number six in 2010 to number 45 this year. The annual consumer brands survey, generated by 2,000 consumer votes on shortlisted brands, also revealed a drop in brand strength for rival technology company Apple, which dropped out of the top 10, falling nine places to number 18. Rolex took out the top spot, while Coca-Cola and Google both crept up two places to secure a position in the top three. Mercedes-Benz and media outlet BBC rounded out the top five. One of the best performers was British retailer John Lewis, which climbed eight places to sit at 13. Fellow retailer Marks & Spencer remained inside the top 20 but dropped from 11 to 17. 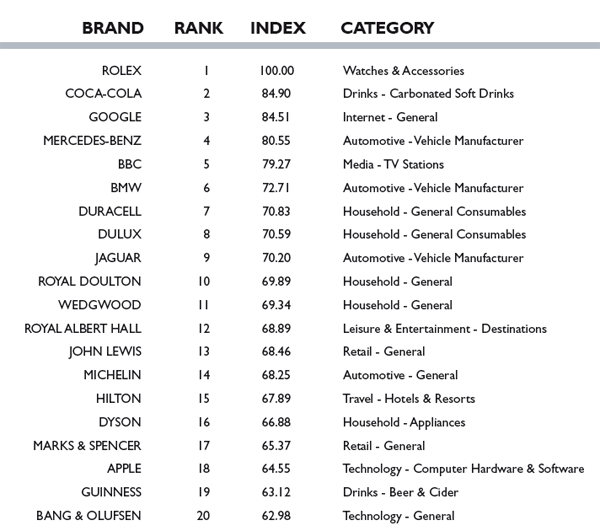 Four automotive and four household brands made the top 20, more than from the traditionally well performing categories of FMCG and technology. Stephen Cheliotis, chairman of Superbrands Expect Council, tells Marketing magazine UK (no relation to Marketingmag.com.au), Britons are reaffirming their faith in many traditional British brands during difficult times. “A Superbrand is one which constantly delivers excellence and quality, and this year’s consumer poll reflects this,” Cheliotis says. Social networks Facebook and Twitter ranked at number 35 and 134 respectively. Respondents to the survey were asked to vote on a shortlist of brands put together by “an independent and voluntary expert council” while considering three factors – reliability, quality and distinction. The full list of 500 top consumer brands can be found here.